New and old are relative concepts. New, novel, nouveau, innovation, these words, full of life and possibility, delight us with their freshness and vigor. Old, antiquated, senescent, passé, these words are the frozen epitaph of time’s passage, balefully indicating the steady erosion caused by months and years. No wonder people embrace the new and scorn the old. So has it been since the beginning. There is a splendid bit of teaching in the Book of Great Learnings(basic learning of acient China): “If you renew yourself, then you must renew yourself again, each day, without end.” In this we clearly find the central philosophical concepts of the Book of Great Learnings: The way of morality, new humanity and the ultimate goal of goodness. The Book of Great Learnings aims to illuminate and edify people in the proper way of study and self-cultivation to achieve goodness and morality. It is a road map to new life, and not just for one day, but until the very end. It seems the ancients were not as obstinate in upholding tradition as we modern people like to imagine. They, too, sought out new life, perhaps just in a different way. Time continually renews itself, the past never repeats itself, and each split second is new. This is all common knowledge. But every split second becomes a past moment the instant it expires. The new and the old extend each other, enhance each other and, in the end, constitute each other. The objects of the world are produced and extinguished in the continual flux of time. New things gestate in the belly of the old. These days, most people consider “new” and “old” to be mutually exclusive concepts. The new is completely novel; the old, totally outdated. The old can be eradicated for the sake of the new and creation of the new world necessarily implies destruction of the old world. But somehow the world that emerges from the gap between us and the old order never seems to add up to our idealization of it. It’s never as perfect, nor nearly as peaceful. Contrarily, the contradictions and chaos seem only to increase. No one has really thought deeply enough about the intimate relationship between the new and the old. Most people in China automatically equate “new” with all things Western. Conversely, all things old are, then, constituted as being Chinese. This thought-pathology has persisted for a long time and is almost an article of faith now. Without fanfare, it has imperceptibly formed a powerful archetype in our everyday thinking: Western stuff is cutting edge, Chinese stuff is backward. In the wake of the ever-advancing West, we consciously debase ourselves. West-worship intertwines with a kind of blind resentment to form a mentality whereby we continually overcompensate for perceived lack. We fail to achieve the golden mean, every step is somehow a misstep and we constantly imagine ourselves to exist in someone else’s shadow. Our present is the West’s past. We lag decades behind. This ideology is China’s tragic present. The relationship between the old and new is no where near as simple. It more resembles a tree, an organic entity. In the beginning it is just a tiny sprout. But the “new” sprout comes from the “old” seed. “Old” and “new” are mutually dependent. When the tree grows up, big and tall, it needs numerous branches, countless leaves and a solid trunk to live. The roots and trunk are old, the branches and leaves continually renewed. Lacking even one of these, the tree can’t live. No matter how long the tree lives, even for a thousand years, the basic formula holds true. Furthermore, today’s trunk is yesterday’s branch and today’s branch is tomorrow’s trunk. The ecology of “new” and “old” in human culture is no different. The problems and questions in contemporary Chinese society all stem from the fact that this basic question has never been satisfactorily resolved. While China actively sought modernization, it simultaneously became critical of tradition, going so far as to completely repudiate it. China’s modernization was based on a superficial misread of Western culture. In its overzealous and unlimited appropriation of all things Western, it buried this fundamental fallacy for future generations. Modern China now faces all manner of crises bereft of traditional roots, especially cultural, spiritual and religious. These are the lifeblood of the people and the nation, which, like the roots and trunk of the tree, provide nourishment and support. Even the anti-traditionalism of the May Fourth movement was still grounded in traditional culture. Spiritually, it was still in the same vein as what had come before. The May Fourth refusal was well-intentioned and was issued from a solid foundation. It was a call for the renewal of self. The biggest mistake of the post-Liberation modernization plan was to jettison traditional Chinese concepts of development, opting instead to import wholesale a European model stressing an idealist political system backed up by trenchant belief in mass culture, science and technology. Culture and society became simple tools for political propaganda. This repudiation of tradition reached its apogee in the Cultural Revolution. Jettisoning traditional characters in favor of the current system of simplified characters is profoundly indicative of this assault on tradition. Post-Cultural Revolution policy of opening and reform has only hastened the pace of cultural transformation, as economic considerations replace political standpoint as the arbiter of life and death. Chinese born after Liberation display little sensitivity to traditional culture, their cultural memories already usurped by the Westernized (or, more accurately: colonialized) trappings of contemporary society. Today, traditional culture has been isolated into an extremely marginal position. It’s become a way to kill time after retirement, or a way to package products designed for western markets. Traditional culture is now little more than fabricated folk customs displayed in museums to gawking crowds while mainstream culture continues inexorably on the path toward colonialized commodification. The fissure between traditional culture and contemporary social life has resulted in the ossification of the once-vibrant interplay of old and new. The age old sense of morality is rarely encountered anymore. This general spiritual impoverishment is reflected everywhere. Scholars, farmers, business people, workers and students alike have all turned their backs on society, replacing the old sense of social responsibility with the single-minded pursuit of immediate gain. Moreover, this gain is only calculated with respect to themselves, irrespective of its impact on other people, society or the nation as a whole. Examples are legion. Officials bend the rules for personal gain or engage in outright fraud. Workers make harmful products. Farmers produce unhealthy crops. Merchants have no credibility, no good intentions and no sense of shame. Teachers have no ability, no morality, no kindness and no ardency. Students have no patience, no language, no interest and no passion. Worst of all, there are few who do not fall within these broad characterizations. People are impetuous. They grasp after the smallest gain which appears before their eyes, completely oblivious to long-term benefit. All this is the result of a root which has been severely damaged and when the root and trunk are sick, can the branches and leaves possibly be well? The implicit value of “new” and “old” is not simple nor can it be arbitrarily determined by blind judgments of right and wrong. Those seeking genuine moral and spiritual renovation should seek the way with a wide historical compass. Only then can they avoid the confused wanderings of the recent past. When the universe was formed there appeared the heavens and the earth. Beneath the heavens there were great oceans, masses of land, tall mountains and flowing rivers. Here life took root. We humans depend upon the earth’s existence and continued vitality. The mountain is the highest point on the surface of the earth. There is a bit of Buddhist thought which runs: the common world is full of imperfection, people’s hearts are full of unclean thoughts, so too is the surface of the earth uneven, full of mountains, peaks, valleys and cliffs. Scientifically, these are but geologic phenomena, created by the action of tectonic plates, the lifeless things which make up the crust of the earth. The ancients were animistic, believing all things to be invested with spirit. To them, the mountain was a deity, and so they worshipped it and prayed to it. Even the emperor would bow to the mountain and make sacrifices to propitiate the gods. The ritual respect which the ancients showed for the mountain was not only tacit acknowledgement of transience and change, but also of awe of nature’s unpredictability. It was their way of re-paying nature’s bounty. There is a quote from the Classic of Yu Gong: “Silk, bamboo, feathers, hides, gold, stone, salt, and iron, all things of use to man come from known mountains. Clothes, food, tools, domiciles, all things made by man are made with materials bequeathed by the mountain, the river and the land.” The ancients obviously recognized their great debt to nature. They cherished the natural environment and would not knowingly harm it. The ancients had a saying: When hunting, do not destroy the forest. When fishing, do not drain the river. There was another common saying: Do not kill birds in spring, because back in the nest there is a hatchling waiting mother’s return. Here we find hints of the urge to restrain man and conquer nature, but it was more their way of respecting natural law and achieving harmonious balance with other forms of life. The ancients recognized that the fate of man and the fate of nature were inextricable. This is quite different from the Western ideal of shaping nature to fit human needs. Traditional Chinese culture believed that all life existed in concert with nature. The ancients saw humans, though chief among all animals but essentially the same as other forms of life, comprising but a part of the overall ecology. Thus, humans emulated nature, lauded nature and believed that only within nature could truth be achieved. The essential trend of modern Western thought has been entirely different. One by one, the traditional religious taboos have been broken. Taking proof as the basis of truth, the West made science the order of the day. Darwin’s theory of evolution not only stole god’s thunder as creator of man, it also instigated a new order of materialist belief: Life was only out to perpetuate itself. This narrative of the natural world gradually became a gospel principal of life and eventually the governing philosophy of human existence. As god was dethroned in favor of chemistry, life and death became a commercial transaction between the organic and inorganic while spirit was remaindered as by-product of organic activity. Under this scheme, man had truly and finally left the Garden of Eden. Naked and alone, perpetually at odds with a cold and faceless nature, he was left to struggle for survival. Might had made right. The strong not only survived, they did so with the blessing of morality. Man’s material desire knows no limits. The mountains, rivers and even the earth itself have become little more than warehouses for man’s greed. It’s not just destroying the forests during the hunt and drying up the river to get fish anymore, now it’s obliterating entire species for wood, leveling mountains for minerals and tunneling the earth for oil. We plot against each other for control of natural resources. We fight each other for the very right to survive. It’s undeniable: Nature is pulp beneath our feet and man has truly become master of himself. With nature dead, what will future generations measure themselves against? Only time will tell. In traditional Chinese culture, the sea was conceived as the end of the world. No one was clear what exactly was on the other side. In the Classic of Mountain and Seas we find accounts of mythical beasts and birds, strange insects and weird fish, as well as a country of creatures, four-limbed like us but possessing supernatural characteristics, living across the ocean. For a thousand years, this book represented the extent of knowledge of the outside world, giving our tillers of fields and weavers of cloth cause for wild imaginings. Except for minor contacts with pirates and emissaries from Japan, the Chinese were unable to grasp the idea that actual nations of people existed elsewhere. The great and beautiful land around them was all they knew. Heroes of the past sought glory and fame here. Likewise foreign encroachment was always because outsiders coveted the fecund fields, beautiful mountains and abundant rivers of the homeland. Conversely, lands across the seas were the home of supernatural beings and the destination of strange hermits. Admiral Zheng He’s grand journey over the seas during the Ming dynasty was but a brief moment of glory. The ocean soon became Europe; the path between, a conduit of wealth; the confrontation of cultures, the beginning of colonial history. Not surprising then that the Chinese still extol ancient glories. In fact the situation shifted quite early on. The ocean has been China’s nightmare for the last 100 years. Opium, weapons, capitalism, churches, science and technology, ideology, political idealism—all these things rode the waves across the ocean and disembarked on these shores. Facing the aggression of colonialism, the Chinese appeared weak. The tillers of fields, who had been born to propitiate nature and compromise for the general good, were helpless against the will to wrench open the borders. China gradually lost its original political philosophy of leading by moral example in its effort to cope with the power of will. The confrontation instigated an unprecedented crisis of confidence in the Chinese people as self-doubt rippled through the culture. Countless people departed this once-mythic golden land to embark on their own journeys abroad, leaving behind scenes of ruin. The ocean once again became the source of new life and possibility. Conquest of the sea re-constituted the instrinsic self-sufficiency of the homeland and the familiar sounds of the farm were drowned out by the clatter and clang of iron and steel. We became estranged from ourselves, fatally separated from our originally pastoral nature. We have lost our intimate appreciation of antiquity. We have forgotten how to lose ourselves in contemplation of the world. We have lost our traditional politesse and dignity. We have lost the ability to think deeply and reflect profoundly. We have lost our sense of history and learning. We have lost our lofty aspiration. We have lost our sense of gratitude toward nature. The great spiritual chain of being has been sundered and we are adrift. The homeland no longer protects us and so we detest it. We try to erase it from our memory. We want the blue of the ocean to engulf the golden hue of the homeland. Let us float! Float toward the utopia of imagination. The classic is a standard with universal applicability. Those books from antiquity which we term “classics” are paradigms which hold for a hundred generations. From antiquity to the present day, the classics guide us, bearing immutable truth transcending the limitations of time. The Yi Jing, Nei Jing and the Classic of Mountains and Seas are living cultural relics passed down since earliest antiquity. They are the well-spring of Chinese civilization. The Classic of Mountain and Seas, on the other hand, is a somewhat different case. It is alone in recording the cornucopia of creatures and beasts and spirits and deities, as well as all sorts of unimaginable things, both in the homeland and abroad. Seventy-five percent of the text is stories of monsters, deities and spirits. Even though the stories have been passed down through the ages, the Classic of Mountain and Seas has been largely ignored by history. Some suggest that, originally, the Classic of Mountain and Seas had no text at all and was only a series of pictures and the subsequent words were only appended later. The majority of the images were re-printed over and over again over a long period of time and nowadays we can only make out a few dating back to Sima Xiang’s “Zi Xu Ci” from the Han dynasty. The text of the Classic of Mountain and Seas was of limited value in terms of political management or pursuit of enlightenment. Its main purpose was simply to increase knowledge, useful or otherwise, and so it cannot really be called a “classic.” The Classic of Mountain and Seas never enjoyed the kind of scholarly attention enjoyed by the Yi Jing or the writings of Confucius. A few Daoist scholars bothered to annotate it, but it never achieved the status of scholarly material. It’s nearly inconceivable that, historically, the volume should still be referred to as a “classic.” But on another level, it makes sense. Even though sages never bothered themselves with the supernatural bestiary, for common people, the stranger the story, the more it aroused their interest. Thus, its great longevity. It was, quite simply, a phenomenon of popularity. I have already forgotten my original motivation for writing the New Classic of Mountain and Seas. I suppose I have seen many strange things go on in our society. So many feelings, so many sensations—I can’t not speak of them. So I chose a particularly unedified point of view as my lens on contemporary society. The menagerie of beasts becomes metaphors for these phenomena. It’s my way of poking a bit of fun. People today use all manner of sophistry to investigate the world. From what’s around them they extrapolate to the furthest reaches of the universe. Whatever can be thought, heard or seen has already gone as far as it can go. Knowledge is too broad, individual life is too short, tangible things are far too few. The world in front of our eyes has fragmented into intellectualized symbols, vast, broad, endless. An individual facing this kind of world can only feel an overwhelming kind of nothingness. Spiritually, there is little that can be termed “unified.” Thus we fall prey to a profound sense of terror punctuated by argument and struggle. This is the promise of civilization? You will have to arrive at your own answer. I really don’t have the temerity to write a new Classic of Mountain and Seas. I just jot down thoughts for my own entertainment which I hope people will read in their own way. If we can share a grin between us, all the better. Besides entertaining myself, if I can entertain others, I reap an unexpected reward. Whatever the case, I wrote this piece in the grip of the moment; the name of the piece likewise came to me rather spontaneously. Nothing more than that. This piece is a fragment of a moment plucked from a transient life. Read into it at your own risk. Xu: Being involved in art for such a long time, QIU Anxiong is indeed experienced. QIU: As far as time is concerned, you can say that. Lu: Before this Solo Exhibition at BizArt Art Center, Shanghai’s art scene was relatively new to you. We know that you graduated from Sichuan Fine Arts Institute, and then pursued further studies in Kassel, Germany. Now you are teaching in a university of Shanghai. So you must be quite familiar with the art situation of these places. Could you tell us something about yourself? QIU: Of course. I worked in Shenzhen for some time after graduation in 1993, but due to the poor art environment of Shenzhen, I soon went back to Chengdu. Then I started painting. At that time, artists in Chengdu had a strong concept of the circle they belonged to. It had two-sides: the good one was that is was accessible. So I first entered it and attended to some painting exhibitions. That life continued during the next 3 or 4 years. In 1998, I went to Germany. During my stay, the broader horizon as well as the entry into a new environment changed many of my ideas. My original definition of art was also modified. What I saw abroad was not new to me. I actually saw them before in China but only indirectly, through some media. In Germany, I had the opportunity to face directly all these new-media artistic forms. Besides, in Germany my living environment was so different. All these things modified my opinions. But it took me some time to put these conceptual changes into practice. Before I came back, I never gave up painting and seldom made new-media works. However, having seen a lot of international exhibitions and the world trends, I felt I should do a kind of breakthrough in the new-media art of China. Then I came to Shanghai. The city has a better and healthier environment for artistic development; besides, young people don’t have many stereotyped bad habits when they create. So I decided to stay. Xu: During those five years when you were abroad, Chinese art environment changed distinctively. How do you see these huge changes? 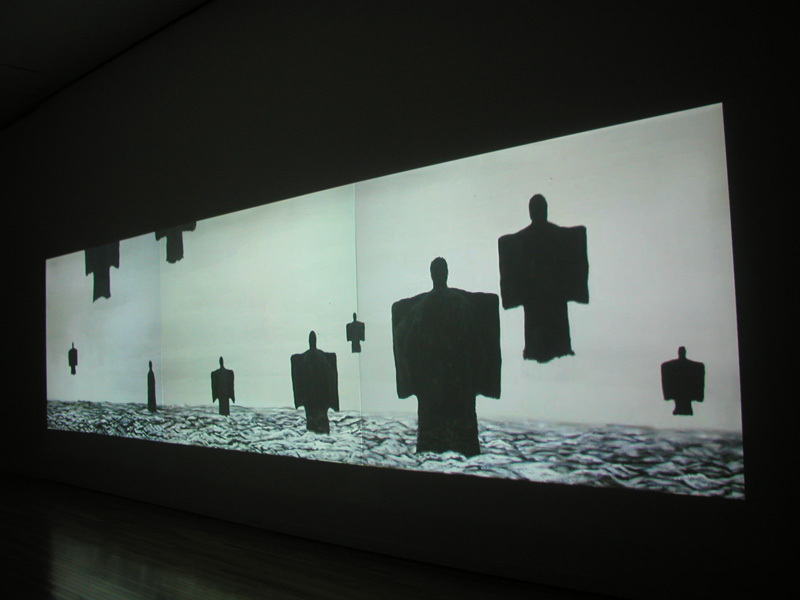 What do you think of the development that contemporary art went through in China while you were abroad? QIU: My opinions change non stop, and at the same time, the direction that art is following is always different, especially recently. Actually Shanghai has witnessed the biggest upheaval. Before the emergence of a bunch of young artists like you, the art scene was quite different, mainly focusing on paintings. However, in the past few years, the activities and exhibitions you’ve done are becoming increasingly internationalized, which contributes to stimulate the artistic environment in Shanghai. 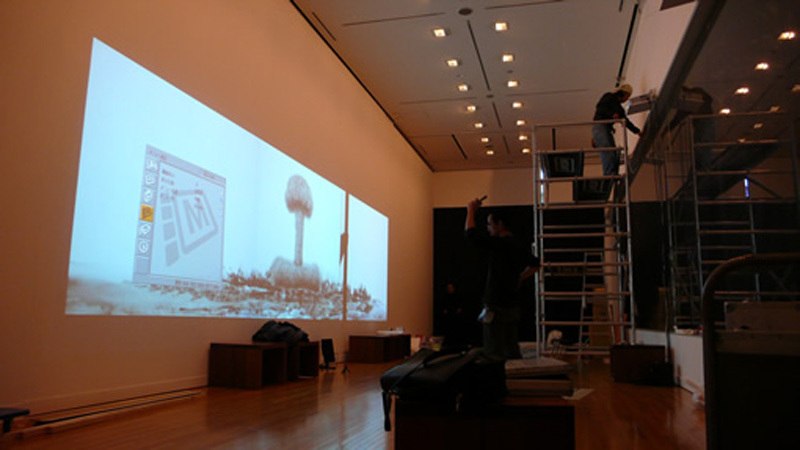 I think new-media art is gradually becoming one of the main artistic forms. I didn’t get involved in those new-media creations when I was abroad, as I thought they belonged to Western culture and thus had nothing to do with us. Those ideas were inherited from my Sichuan period and influenced me a lot. Of course now I don’t think so. This is a trend and it’s happening here. Besides, in fact, I started to be interested in new-media art many years ago. Around 1995 when I came back from Shenzhen to Chengdu, I created some quite conceptual works, such as drawn maps, dictionaries copies, etc. They seemed quite unsuitable at that time, I got frustrated, and gave up. Xu: What was your strongest feeling after coming back? QIU: Before coming back I intended to make an attempt with new-media again. I was sure it was the first step I had to do, even though I didn’t know what was waiting for me ahead. For a time, I wasn’t used to the life in Shanghai. As you know, during my stay in Germany I regularly came back to Chengdu. Both places are very relaxing and have a slow rhythm of life. Moreover, I was studying in Germany and I had to face a completely different situation. Both my identity and environment changed. I had to face the pressure from work and life. Shanghai has a very fast pace of life, which is so striking and somewhat extreme. Further, the quick growth has dehydrated the city, making it so dry and boring. Shanghai hasn’t been as embellished as those old towns with the glamour of the old good days. XU: Embellished in terms of life’s details? QIU: No, it’s just a feeling. We have too many newly-developed cities, including Beijing, Shanghai and some small towns, which seem just the same, with similar patterns and styles. The quick expansion has brought the lust for money, the pursuit of profits, but no humane and refined cultures, which are exactly the things we need. Cultures can enrich and embellish a city as well as a nation. The lack of humane atmosphere is what makes the city dry. That’s what I mean. LU: So it’s our responsibility to add more water. Xu: Let’s talk about your solo exhibition “Time Decoder”. It gives us a brand new impression, so different from your previous works and the ones we saw in your studio. Last time Lu Leiping and I went to your studio and saw two pictures, the “New Landscape”, and your graduation creation in Germany: a propylene landscape painting. In addition, we watched two video works “Jiangnan Cuo” and “Butterfly effect”. They all have a basic tone. QIU: Yes, the basic tone is China. XU: Right, the Chinese background and also the theme of time. But, this time the exhibition is quite close to life, joyful and rich, with a flow of emotions, which very different from the above-mentioned works. For example, the video “Jiangnan Cuo” gave me a different feeling when I saw it in the exhibition hall. Its role had changed. QIU: Exactly, besides, relations also changed. Works in “Time Decoder” have a lot to do with my knowledge’s background. Their realizations followed different directions, just like casting a net. The main reason is that I’m interested in a lot of things and so I want to try them all. But generally speaking, the core is time. Time is perhaps implicit in paintings, but very explicit in videos. In my eyes, time is very basic to life or to our existence. My interest in time probably comes from my belief in Buddhism. In the modern world, according to most of the people, time equals clock, which is objective and unceasingly moving forward. We take it in a rational way, no matter how we live. It’s something perpetual in our eyes. However, with the growing knowledge in Buddhism, I have new approaches of time and life. Time isn’t constantly objective. It’s related to personal feelings. For instance, as you stand before the artwork “Jiangnan Cuo”, you’ll feel as if time is prolonged, passing slowly. Why would this happen? “Time” we experience in modern life is like a device of measurement. We are used to a quick-paced life; in particular, the length of a video is measured by chapters and montages. But this work has presented a real “time”, the actual length of time. That’s why you’ll feel as if time was prolonged. Therefore, “Jiangnan Cuo” can help explain the implications of “Time Decoder”. Lu: What about the other works? 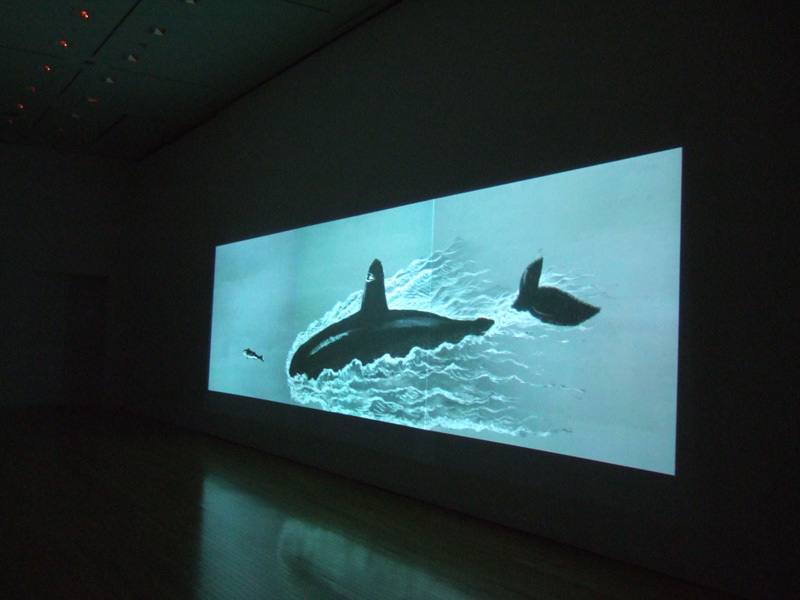 QIU: The animation “In the air” deals with the relationship between human and the external world, or the surrounding world. Maybe these kind of big topics aren’t popular, but I’m obsessed with it. He An once said I was a kind of environmentalist. Well, I think that is just a personal attitude. 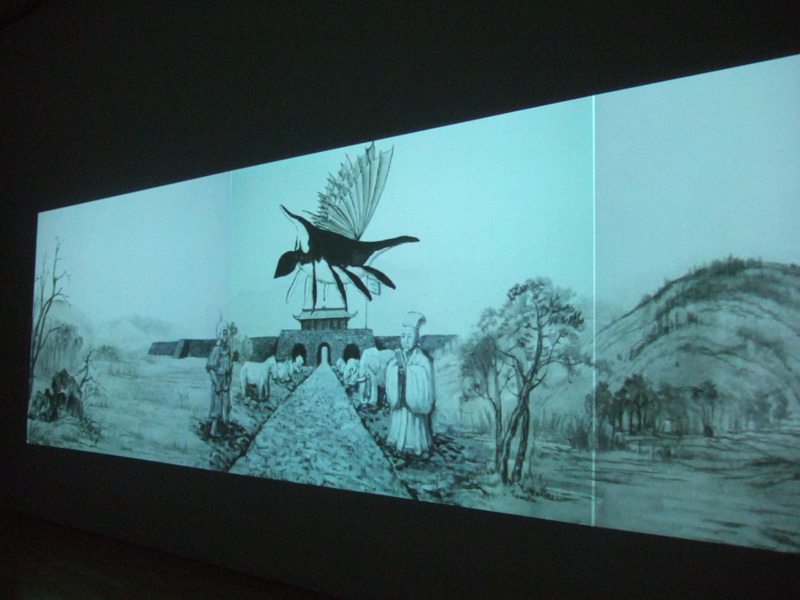 I like Kentridge very much, his influences can be found in this animation. Besides, the work is represented in the form of Chinese ink painting, which is a combination of my personal hobby and my past experience. As for the big light boxes, at that time I wanted to produce a scene to reflect the relationship between man and nature. Light boxes present artificial objects in the nature; while a sculpture of a citizen sits in the space. I named it “Let me forget it all” which expresses a feeling of being far away from nature. In reality, I’m afraid nature is just an illusion to urban souls, or maybe just an image. Xu: The audience in the showroom is more sensitive to single pictures, such as the ones with the rhinoceros and the tiger. QIU: Yes, these are the contents of those images. Xu: The funny thing is that the content of these pictures are the most impressive part of this exhibition. But I only understood the frameworks you’ve set and the reason why you use that sculpture after your explanation. QIU: I won’t force my audience to understand the works the way I do. That isn’t what an artist should do. The audience have their own choice. But the key is to attract them. Those single pictures play such a role, and stimulate the audience. After all there must be something to provoke them, make them think and question, or touch them. LU: Above we’ve discussed three main works of your exhibition. What about the other three? What are their roles? QIU: They play leading roles, and were thought according to the exhibition needs. I tried my best to make the presentation diversified and abundant in terms of both space and media. LU: Won’t that cause any problems? Won’t your works seem discursive? That’s a possible illusion. QIU: Not an illusion, but an instinct. LU: You seem to be the kind of person who can sense art and develop art in life at any moment. I remembered once I saw you making a small thing at home. It was your daughter’s toy and she had broken it. But you told me it was quite interesting and you could develop it into a work of art. QIU: Well, that’s me. Some artists are concentrated on one specific type of creation. They draw a line for themselves and stick to it. Anything beyond the line will never excite them. Whereas, my extensive interest leads me to try a lot of things. Perhaps over time I’ll know better which direction is the most suitable for me. But I think it’s always good to be curious about new things. LU: In fact over the years in Germany, you kept creating propylene paintings in the style of Chinese-ink landscape paintings. Now you are trying something new. Why are you so keen on trying new things? QIU: At that time, painting as a medium already lost its appeal to me. Maybe that’ll be interesting to me later. I had painted for three or four straight years and came across various boundaries to express my ideas. Besides, I was worried that the gradual commercialization of this medium would have negative influences on me. So I decided to change this medium of expression, in the hope of moving aside that influence. Negative influence is something unavoidable: your relation with the art gallery limits your creation. It’s particularly true when this is prevalent in the art environment; for example, in China, artists are used to seek a style or a pattern. You may say “I don’t care”, but that influence is unavoidable when you are painting. That won’t happen to new-media creation. There are various medium of expression which could be used extensively. You can make a great amount of new things, as long as you can imagine. I’m more comfortable with this way of creation. Sometimes, I just feel the impulse to create fresh new works. XU: What’s your attitude towards Chinese-ink paintings? Since we hardly have contact with this, we can’t tell whether it falls into the category of contemporary art. QIU: Frankly, I’m not drawing traditional Chinese painting. So I’m not that familiar with its concrete development and transformations. As far as I know, there are some controversies about what its future will be and how to promote it. Some people think it should be more abstract, or east-meets-west. Others dispute about how to develop the techniques. I don’t consider them as big problems. Chinese-ink painting is a wonderful inheritance from our ancestors. What makes them wonderful? Only because of the exquisite techniques? No, that’s not the point. As a matter of fact, those techniques aren’t an obstacle nowadays. The key is the underlying essence. To be exact, maybe you won’t take my propylene works as Chinese-ink paintings, for I didn’t use any rice paper or Chinese ink. But many people recognize my atypical Chinese-ink painting. Why? Because I’ve incorporated the essence and touch of traditional Chinese painting into my works, and they articulate themselves in a natural way. So I won’t deliberately paint them in the traditional way. I want the feeling and need to know how to grasp it, and then the technical aspects will follow automatically. In my opinion, if you can truly grasp the essence of traditional Chinese culture by immersing yourself in it, the paintings will naturally touch the right chord and articulate themselves. There should be no limitation on the vehicle of expression; no matter if it is video or anything else. You don’t have to use new media; just choose the one you feel most comfortable with. And my choice is to use water and propylene on canvas, which may have some hints of Chinese style. What I bring out is the underlying essence. 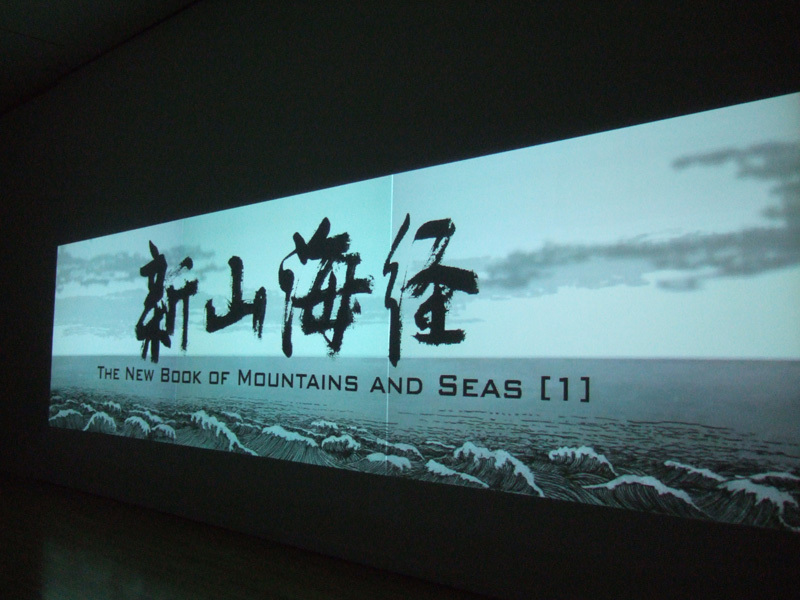 LU: Many of your works show a strong Chinese style, including those propylene paintings and “Landscape”. They are all very traditional, even a bit too Chinese. XU: Most Chinese people are proud of things with distinct Chinese features. When I see these works, maybe the first thing in my mind is not what the artist is going to tell, but how his Chinese identity influences him. QIU: Influence does exist. I was very sensitive to my identity in Germany. Before going abroad I wanted to enter the world of Western culture. But when I was over there, I found myself standing in front of an invisible glass wall which prevented me from penetrating the other side. That gave rise to a huge change in my thoughts. No matter how good my German was, no matter how long I would live there, I was forever and ever a Chinese. That’s something you can never change. So I felt ashamed and embarrassed when I couldn’t answer to some questions about China. How come I didn’t even know these things about my motherland? I was at a loss for a time. I used to be crazy about western avant-garde culture around the age of 22. At that time, I was an enthusiastic young person committed to the avant-garde art while knowing nothing about my own traditional culture, which didn’t seem do to have no relation with me. But later, after knowing something about it I felt a bit interested. In fact, that’s something lying deep in all Chinese, for that’s our roots. Such feelings became stronger when I was abroad and I started to introspect myself. XU: In other words, you can never get rid of those very Chinese features. QIU: Right. This identity, or in a sense boundary, is rather important to me. Actually we all live within some boundaries. It’s impossible to be unlimited. Each person is limited to certain rules. For me, the modern life and the real environment are things I can never turn away from. We always compare China with foreign countries to see whether we lag behind them, say America or Europe. That’s not bad. But we’ve forgotten something else, such as: where we are from and where we are going. If we dismiss the idea of our own identity, we will be in a passive state. China experienced a dark page in history, which was a big blow to the whole nation’s confidence. The lack of confidence further led to an extreme attitude towards our own traditional culture; we are sometimes too critical and skeptical which is too simple and crude. That’s not good. We should rationally choose the suitable things while considering our own situation. In fact from the very beginning the introduction of Western culture into China made people become radical and that attitude unavoidably influenced me. However, if you try to understand it, you’ll see traditional culture is not as feudal or superstitious as expected. It is indeed very resourceful. I think it’s necessary for all of us to learn about it and thus understand our identity. XU: What is art to you? The artists I interviewed the other day told me art was a cure to them. QIU: First, as far as I’m concerned, it is interesting. I have the desire to do art. For instance, the exhibition gave me a feeling of satisfaction and pleasure, while others things probably won’t do. LU: As far as I know, Buddhism is very significant to you. What do you think is the relationship between your involvement in art and your commitment to Buddhism? QIU: Above all they are compatible. According to Buddhist lections, Buddhism is not contradictory with any worldly ethics. The involvement in this religion has greatly affected my view upon life and that impact is reflected in my works. As you all know, Buddhism teaches people to give up secular affairs. But I still can’t drive all worldly things out of my mind; I still have desires. At least, nowadays, I don’t have the courage to forget everything to turn into a monk. I remember something from the Zen religion: if you can’t abandon it then undertake it. So why don’t I just do it if I still have the desire to do so? LU: I find you very nostalgic. You are not willing to forget any experience or feeling in your life; you collect them as treasures. Such a personality, in my opinion, is not suitable to be a Buddhist. QIU: Yes, I’m very inflexible. For ideas I can’t forget and dismiss, I will try to carry them out. After that I can forget them. LU: Forget right after doing it? QIU: Yes, my attitude can be reflected through this couplet I saw in Chengdu literature institute: “See it, do it, then forget it. What is difficult about this?” It was so impressive, such a smart thought! If you can’t stand aloof from worldly affairs, then you should join them. XU: I don’t know how to make it? QIU: I think it must be easy. Copyright ?1998-2006 Shanghai BizArt Consulting Ltd. All rights reserved.